Ribble Coast & Wetlands Walking Festival 2009 - and Launch of Ribbleside Friends Group! The new "Ribbleside" Country Park, Penwortham to Walton le Dale, on a misty Autumn morning. The Ribble Coast & Wetlands Regional Park is hosting its Annual Walking Festival from Saturday 24th October to Sunday 1st November - and there are some fantastic walks being organised so make sure you don't miss out! - Save The Ribble's Ribble Ramble on Sunday 25th October, walking from the Old Tram Bridge upriver to Brockholes Wetland & Woodland and back, starting at 10am from the Tram Bridge. The Ribble Ramble is approximately 6 miles in total and we expect to be back at the Tram Bridge by mid-afternoon at the latest. The going is fairly easy though there are some stiles. Bring a picnic, your camera - and waterproofs if it looks like rain! 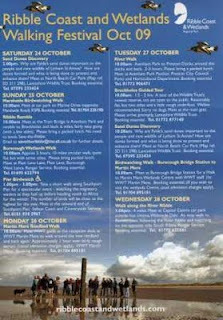 - On Tuesday 27th October, there is a River Walk from Avenham Park to Preston Docks leaving Avenham Park Pavilion at 10am, 2-3 hours in total; or alternatively, a Guided Tour of Brockholes at 10am the same day; or perhaps you fancy the Fylde Sand Dunes at Lytham St Annes, or does a Walk from Burscough to Martin Mere take your fancy...? ... there is a Ribblesider's Ramble on the newly-established "Ribbleside" Country Park opposite Avenham & Millers Parks on the South Ribble side at 1pm - and this is the first event being organised by the NEW Ribbleside Friends Group! They will be leaving the Old Tram Bridge at 1pm and walking onto Preston Junction Nature Reserve then into Carr Wood before walking on to the River Darwin where it meets the Ribble, then walking downriver alongside the Ribble back to the Tram Bridge. The walk will be 2 hours or so, and does involve a few steps and stiles. There is no need to book, but if you'd like further details about the Ribblesiders' Ramble - or the new Friends Group - then please email Jane at ribblesidefriends@tiscali.co.uk . You'll be hearing alot more about the Ribbleside Friends Group over the coming months, but in the meantime, get out Walking The Ribble Coast & Wetlands this Autumn! If you'd like further details about the Ribble Coast & Wetlands Walking Festival, then go to The Ribble Coast & Wetlands website. You can contact us at savetheribble@tiscali.co.uk .